With the aid of Tylenol PM to help me finally sleep most of the night, I’ve finally moved past my jet lag now. I’m ready to resume posting and hope I still have some readers out there somewhere. I went nearly four weeks without posting. The best internet service I found in India was in Nagpur, where I presume the service was through cable, otherwise broadband was very slow and there was apparently a language problem with the server–which resulted in those eerie headlines with no body. As early as the original trip planned for 2010 when I was diagnosed with cancer and thus forced to cancel that itinerary, there seemed to be a black cloud hanging over our planned travel to India this year. Barely two weeks before we were to leave, I began having horrible pain on one side that seemed to reverberate through my ribs and resurface on the back. It was bad enough that I landed in the emergency room and put through a CT scan where they discovered some problems, but nothing serious enough apparently to make us abandon our plans again, even though it was obvious that we might be the biggest fools the medical staff had encountered in awhile. As for me, I decided if we canceled I’d feel worse than if I doped myself up on pain pills because in the back of my mind I was sure–if nothing was seriously wrong in my body–the pain would subside eventually. It did, when my rheumatologist finally had a good look at the rash that by that time had begun to show up on the painful area on my side. Shingles! With a couple of days to spare before we left for NYC, coupled with expensive prescriptions, the pain was more or less in control by the time we left NY for India. When we landed around mid-afternoon in New Delhi, I began to wonder anew if the powers that be were trying to warn me of something with a new threat. There had been a boiler room explosion at the Bamyan, where we had been booked. 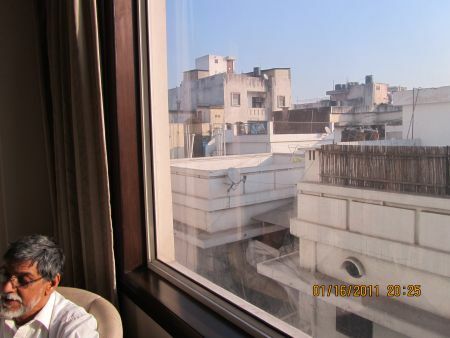 Our rooms were quickly switched to the Clarks Inn in Lajpat Nagar, which didn’t look like much on the outside but the rooms were pretty nice. It had a modern western-style toilet and a huge breakfast spread was provided every morning. You could have Indian style specialties or go for omelet and bacon or sausage. The only bad thing was the location, on a side road near the Moolchand Flyover, which is akin to an interstate connector in the U.S., so it was quite noisy at night. Like Las Vegas, New Delhi never goes to sleep. Somebody or other is always driving and honking their horns. There are even trucks that request on their back bumpers “please sound horn” and just about everyone obliges! One thing about India that has never changed in all the visits I’ve made is how the cities are teeming with life. The shot below is outside our hotel room very early in the morning. Just minutes later, there were several young men changing from their apparent uniforms on the section where you see the satellite dish. I assume they worked nearby and slept on the roof as this happened each morning. Later I noticed them hanging up laundry to dry. The buildings surrounding seemed to house families as I witnessed women hanging wash to dry on their balconies every morning. After familiarizing ourselves with nearby amenities available, we set off to find a “light” dinner so we could turn in early. We’d left NYC around 5 PM Saturday, now it was only around noon Sunday there. But jet leg and general fatigue had begun to set in. 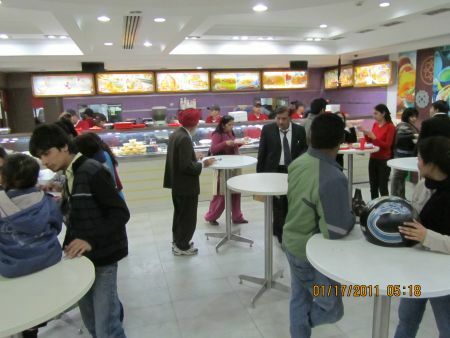 This is the interior of Haldiram’s which was close enough we could walk to it from the hotel. It’s a great place to sample food specialties of all areas of India. Even though it was much more food than I needed, I couldn’t resist ordering my a South Indian favorite, masala dosa, which is a very thin rice pancake thing stuffed with a spicy potato mixture. Not only is it delicious, it’s chock full of proteins and carbohydrates. There’s an elaborate system for making a purchase, one that involves going through several workers. 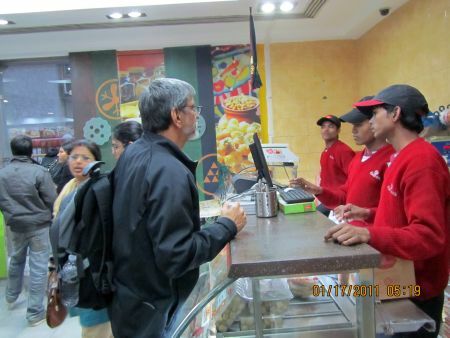 You choose what you want, then go to the cash counter and order, then pay for it. Then you take the chit they give you to the food counter, and they finally dish up or prepare your food, just like fast-food joints in the U.S. except that more people are involved in the transaction. Even though it was confusing to the newcomer, and it seemed to us it could have been easily streamlined by making it cafeteria style with a cashier at the end, thereby less confusing, we decided it was not up to us to tell others how to do things that seem to work perfectly well in their country just the way it is. We decided it was a good system that made more jobs for more people, and considering the number of people we’d encountered within a few hours of our arrival, that seemed like a good thing. 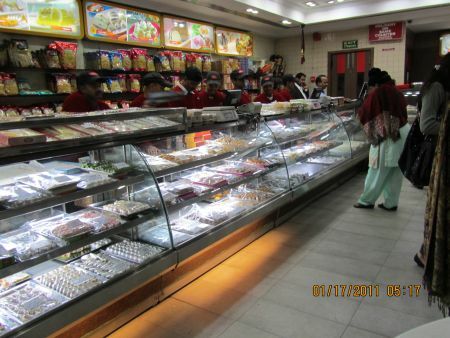 This is the sweets counter. I highly recommend this section as a take-out, because you wouldn’t want your friends to see you pig out. Among my favorites are Gulab Jamun, a treat commonly served at weddings. It’s made of a dough made with milk solids rolled into a ball with flour and then deep fried, then placed into a sugar syrup flavored with cardamom and rosewater, or saffron, Rasmalai, a sugary, cream-colored, flattened balls of paneer soaked in clotted cream and flavored with cardamom, and Soan Papdi, sort of a flaky Indian dessert made with besan flour, ghee and sugar. It’s flavored with cardamom and rose water and garnished with toasted pistachio or almond. Though all are extremely delicious, and generally available at most Indian food establishments in the U.S., I wouldn’t recommend indulging more than VERY occasionally as they are all very rich and very sweet. 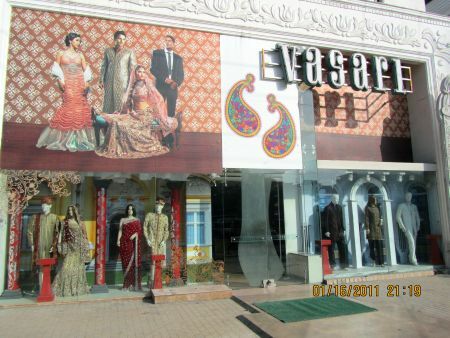 After we’d taken care of our tummies and salivated over all the rich treats we hoped to sample later on during the trip, we walked back to the hotel with just enough daylight left that I tried snapping a shot of this shop specializing in wedding apparel and got in trouble with the guard. The building was closed, and apparently photographs aren’t permitted because who knows who might be out and about spying and stealing fashion ideas!? I apologized profusely and acted generally ignorant and left without having my camera confiscated. The next evening, ML and I would finally get to satisfy our curiosity by actually entering the store to see everything up close. I don’t think the guard remembered us at all. Next time I’ll show the pictures of the bride-to-be we met as well as a few other designs . . . as long as you promise you won’t copy any designs you see here! Fascinating! I think I gained weight just reading about the food. Now I’m off to look at the photos. Lovely, Alice. I’m looking forward to the entire trip. I’ve been wanting Indian food since I saw the movie, “Today’s Specials” and you have certainly reinforced my desire. 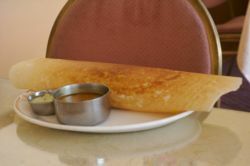 I love masala dosa. The best place to get it here is out in the burbs. Have to wait until the snow disappears. Lucky you! Our masala source here in SLC is unreliable at best. One day you can find it, the next day the place isn’t doing south Indian anymore. Any time I’m in the vicinity of San Francisco, though, I know exactly where to go! Kay, you’ll love the wedding sarees I’ll bet. They’re harder to find, true, but I like to think there are still some good ones out there. Finding them is the big puzzle. I didn’t think of that! What he didn’t know was that I already had my picture. Thank goodness there was still enough light that the flash didn’t announce it. Mind you, all this was carried out in his language (Hindi?) and English and lots of gestures! This was only the beginning of several misadventures of mine as it turns out. Keep tuned. I have had a feast! Loved te post and all the photos. Welcome back! Hubby and I have been keeping our 9-month-old grandson for about four nights, so I will be catching up on your posts as I “recuperate”! That rice pancake thingy sounded delicious. Sweets, hmmmmm, maybe if I could split with a bunch of people! Except for the Gulab Jamun, which a couple of different families served us, we did the same thing–with the Rasmullai sister-in-law picked up from a Haldiram’s in Nagpur. Hope you’ll get to try some sometime.